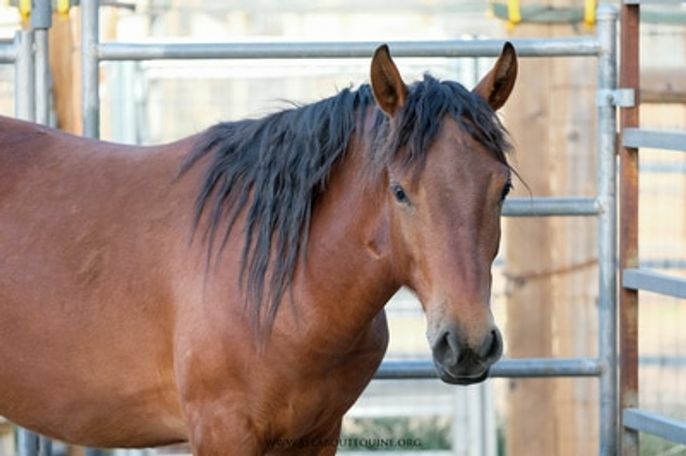 Diesel came to AAE from the USFS in New Mexico after participation in a wild horse gentling program at the Monty Roberts International Learning Center. Diesel is a cute and curious guy. He halters and leads with a very slow, gentle approach. He tries hard, but he is still gaining confidence and trust in humans. Diesel was part of a group gathered off the Jarita Mesa Wild Horse Territory in the El Rito Ranger District of the Carson National Forest. After branding day in El Rito NM on June 30, 2016, they were available for adoption in El Rito for 21 days, (7/1/2016 to 7/21/2016). Then they were moved to Bloomfield NM and were available for adoption there for 28 days, (7/22/2016 to 8/18/2016) where several were adopted. A small group was transported to Flag is Up Farm in Solvang CA, where they went through a wild horse gentling program with students participating at the Monty Roberts International Learning Center. They were available for adoption for 75 days, (8/19/2016 to 11/1/2016) and two more were adopted. After November 1, 2016, the USFS decided a good faith effort had been made (three strikes), and the horses were offered for sale ($25) without limitation. Sadly, Diesel was diagnosed with Equine Protozoal Myeloencephalitis (EPM). He was treated; however, still displays neurologic symptoms, and should only be adopted into a companion home. Due to the residual neurologic symptoms, he should not be ridden. Diesel will need a patient and committed partner to further his trust and confidence. He is current with vaccines, deworming, and hoof and dental care.